Spin is a Finnish science fiction and fantasy magazine published by Turku Science Fiction Society since 1977. 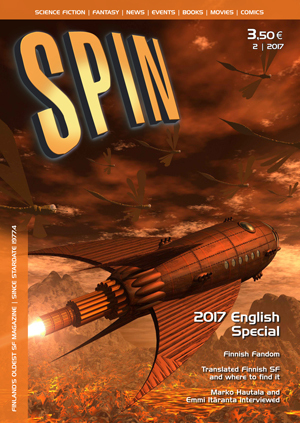 Spin publishes domestic and foreign sf short stories and reviews, articles and news about books, movies, comics and other issues related to the field of speculative fiction. Spin is being published two to four times a year, with colour covers, 40 to 60 pages per issue. The subscription of Spin is included in the membership fee of TSFS (15 euros in 2019). Spin can also be ordered without a club membership with the price of 22 euros. In 2011 Spin made the first English Special in the history of the magazine. The issue was distributed in the Finncon-Animecon event in the summer 2011, and it aimed at giving foreign readers a glimpse of Finnish sf/f and the Finnish fandom. In 2017 Finland hosted Worldcon for the first time. To celebrate the occasion TSFS published not one, but two English specials, one for fact and one for fiction. All three English specials are still available and it has been given as a souvenir for our English speaking visitors and foreign contributors. Do you have questions about the magazine or its content? In this case, please contact Spin's editor-in-chief. If you have a short story or other material you want to offer us, please contact our submissions editor directly.